I have had a dedicated reader of my blog, an intelligent Dominant named Dominick. We first met when I was blogging at Blogdrive, lo these many years ago. 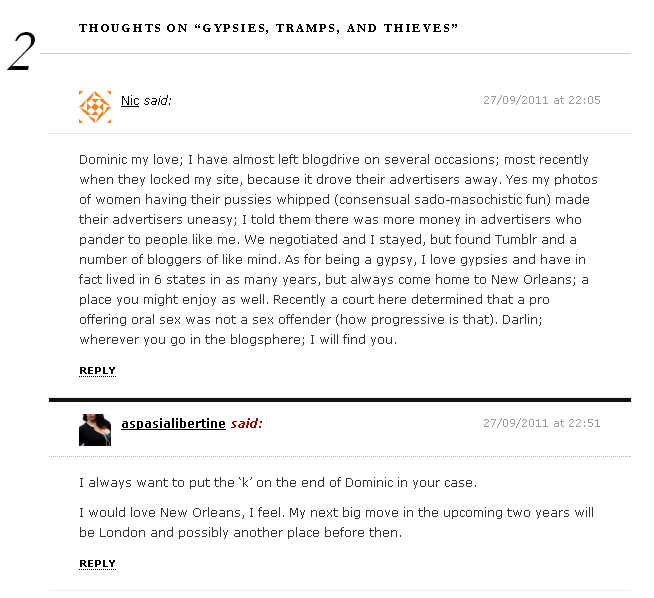 He commented on this blog here about my tendency to move around. He’s right. I’ve gone from Blogdrive to Blogspot and now, WordPress. He’s not the first to comment on this tendency of mine: all of my family does. I usually just explain it as, “Well, I like change” but being honest, I’m just a bloody gypsy (excuse the connotation for a moment). Truly, I would not be surprised if my not-so-talked-about Irish ancestors were Pavee (you know them as, Travellers). But staying in one place for too long, honestly, chafes. I can do the same thing for extended periods of time, like being a Tramp (professionally or not, more not these days). However, I change apartments more than I change blogs, though that’s usually because in my periods of not being a professional Tramp (like now), I’m broke. Yes, I will be reversing that situation when I lose the weight I regained and get “more settled” in my non-professional life. This isn’t because I am messy or flaky. But I seek out new experiences and new people and you can’t have those if you stay in one place. I have stayed in one place for an extended period of time that wasn’t me living with my parents as a child, but then I travelled a lot to compensate. Growing up, outside of a single household move from a lakefront condo to a home with a yard at the edges of the city, my parents didn’t move around. They lived in that house for about 26 years until losing it recently to foreclosure (like so many others). Of my parents’ two children, I was always the more kinetic one, the one that was always ready for a trip or an adventure…with or without them. Amazingly, my teenage years weren’t marked by long, mysterious absences because my focus was on my studies. That changed as soon as I went away to school, which was already a compromise with my (tuition paying) parents as it was not as “away” as I would have preferred. As you might imagine, the response from my mother was hysteria and the nightmare that I was lying dead in a ditch. Having to spend long periods of time at home, especially for the obligatory holiday period, makes me itch. I become like a caged animal when I lack the freedom to move as I please. The idea that being “grown up” means settling down and barely moving doesn’t appeal to me at all. But I have a different idea of what being grown up means.